Archipelago Hostel is located in a 17th century building in the very centre of Stockholms ancient Old Town, only one minute away from the Old Town metro/subway stop. The Royal Palace is only two blocks away and so is the Cathedral, the Nobel Museum, the harbour and the ferry boats for Djurgarden. 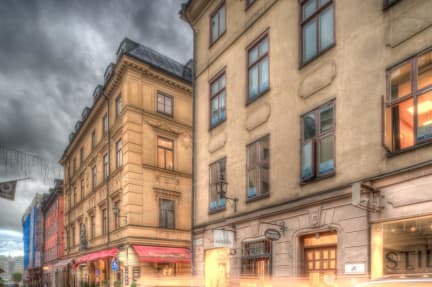 Local shopping, restaurants, coffee shops and boutiques are found immediately outside the hostel on the historical steets and alleys of mediaeval Stockholm. The hostel provide private rooms as well as dormitory rooms. All beds are supplied with duvet and pillow. Bed linen and towels are available at reception at an additional charge. Bed linen must be used at all times. Guest may bring their own or rent a complete set upon arrival. Sleeping bags are not allowed. Check-in is available from 14:00 (2pm). Late arrival is exceptional and late arriving guests need to communicate by e-mail in order to receive approval for late arrival and to receive necessary arrival details. Check out is required by 11:00 am. The property has a strict age requirement of 21 years. Persons below the age of 21 years will not be permitted to stay without a related guardian of at least 25 years of age. Maximum age for staying in a dormitory is 40 years of age. For reservations of more than 3 rooms or 5 persons, the total amount of the reservation will be charged on the day of booking and charges are non refundable. If reservation is cancelled less than 48 hours prior to the date of arrival, charges will apply equivalent to the amount of the first night's stay. Charges for a one-night-stay reservation will be processed 48 hours prior to the booked date of arrival. Charges will be made from the credit card given on reservation. If charges are rejected or card is declined, reservation will be cancelled. All arrivals should report at the main gate on Stora Nygatan 38. Simply push the door phone for contact with the hotel. Once identified, guest will be let in by the security clerk. Security screening apply for all late arrivals and a fully prepaid reservation is required in order to have a late arrival approved. There also need to be a valid and fully chargeable credit card on all reservations. Please note the need of a valid and chargeable creditcard on the reservation in order to have a late check-in approved. Minimum age for staying at Castle House Inn is 21 years of age. Maximum age for staying in a dormitory is 40 years of age. Cancellations for non-restricted reservations are free of charge until 48 hours prior to arrival. Payment by cash or credit card. The property may pre-authorise credit cards prior to arrival. Name on reservation, credit card and ID/passport must match.